Josep Puig i Cadalfach is regarded as the last representative of the architecture of modernism and the first of Noucentisme, the following style era. 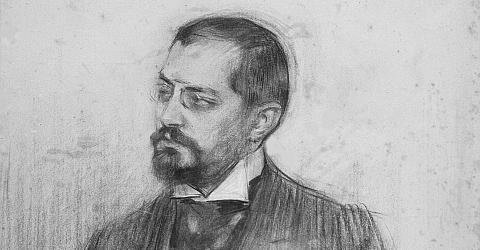 He was not only an architect, he was also an art historian and politician. The list of his buildings, which he realized in Barcelona and the surrounding area, is long and extensive. Basically, his creative period can be divided into three periods of style: modernism, idealism and monumentalism. Josep Puig i Cadafalch was born on the 17th of October 1867 in Mataró, an industrial town at the coast about 20 km north of Barcelona. He studied architecture and "ciencias exactas" in Barcelona, which means mathematics, physics and other natural sciences. After completing his studies, he took over the office of the Municipal Architect in Mataró. For five years he worked in this position and during this time his first buildings were built in Mataró. He received the professorship of Hydraulics and Strength of Materials at the School of Architecture in Barcelona. In addition, he also engaged politically, for which he was elected in 1917 as President of the Mancomunitat de Catalunya, the Catalan Parliament. There he developed ambitious plans for education and culture and initiated the archaeological excavations in Ampurias in the province of Girona. In addition, he campaigned for the construction of roads and the development of agriculture. The construction of the Codorniu winery in Sant Sadurní d'Anoia, south of Barcelona, is one of the most significant works of Josep Puig i Cadafalch. The name Codorníu stands for a family of winegrowers whose roots date back to the 16th century. With 450 years of history, Codorníu is therefore the oldest family business in Spain and one of the oldest in the world. In 1895 Josep Puig i Cadafalch was commissioned by the family with the expansion of the sparkling wine cellar. 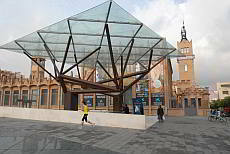 The building became a stone carved homage to cava, as it reminds of the stems of cava glasses. The winery was declared a national heritage in 1976 and is one of the most impressive examples of architecture in the production and cultivation of cava. In his first creative period, he devoted himself entirely to modernism. As a model for his buildings Puig liked to use the country house of the Catalan nobility, to which he then added Nordic style elements. This style period includes the decorative Casa Amatller, which belonged to the chocolate merchant Amatller, on Passeig de Gràcia. The Casa Martí, home to the famous coffee maker "Els 4 gats", and the Casa de les Punxes, the dream castle of the three Terradas daughters. These buildings were built around the turn of the century between 1895 and 1905. The restaurant "Els 4 gats" is especially legendary. It used to be the meeting place of modernist bohemians like Santiago Russinyol, Ramon Casas and Pablo Picasso. The coffee house caught the eye because of its unusual amount of refined, artistic details combined with the typical features of a traditional hostel. "It's more than an imitation of the" Le Chat noir "of Paris", the famous Nicaraguan writer and diplomat Rubén Darío said after he first entered the bar. Everyone came to Barcelona to visit this place and to enjoy the good food. "The food of the spirit" as it was called. This was followed by the period of rational idealism, a style oriented primarily on the preferences of the new upper bourgeoisie. The buildings were planned according to rational and practical criteria. This period includes the Casa Trinxet, one of the jewels of modernism in Barcelona, ââthe Casa Muntades, a pretty detached house on the Tibidabo and the Casa Company, considered the first building of the "white epoch" of Puig i Cadafalch. His third creative period is called "monumentalism". It developed parallel to the preparations for the 1929 World's Fair in Barcelona, for which Puig as chief architect designed the general plan of a uniform design of the exhibition. But after the takeover of power by Primo de Rivera in 1923, a new competition was tendered. As a result, numerous architects were commissioned with the construction of individual sections. The result was a smorgasbord of different styles, which harmonized little with each other. The buildings of Puig i Cadafalch were influenced by Roman architecture. In combination with typical Moorish elements of the architectural styles of Valencia and Andalusia. Finally, a neo-Baroque style was born. In response to the "romantic chaos" of modernism, the Noucentisme prevailed in Catalonia, as a new cultural trend in 1906. In contrast to modernism, the Noucentisme succeeded in creating the link between society and culture. It was a clear reaction against liberalism, romanticism, naturalism and pursued ideals such as reason, accuracy, seriousness, order and clarity. In architecture, this was expressed in the form of clean lines, color reduction, harmony and sobriety. Josep Puig i Cadafalch gave the first, decisive impulse for this new style epoch with the buildings Casa Trinxet and the Casa Company in Barcelona, ââwhich are attributable to his second creative period. 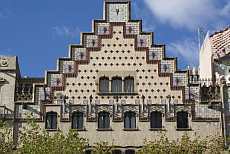 Puig i Cadafalch was the only one of the great architects of modernism (Antoni Gaudí and Lluís Domènech i Montaner), who continued to gain importance after the Modernisme in the following period. Puig i Cadafalch was passionate in his field. In addition to working as an architect, he also wrote essays and books on Romanesque and Gothic architecture in Catalonia. During the Spanish Civil War he lived in exile in Paris where he taught architecture and history at several universities. For his great commitment he received an honorary doctorate from various universities, including the University of Paris. Upon his return to Barcelona, ââthe new regime no longer allowed him to work as an architect. As a result, he dealt with the restoration of historic buildings and monuments. In 1956, Josep Puig i Cadafalch died at the age of 89 at his home in Barcelona. For his life's work, he is still often quoted and praised. The Casa de les Punxes breaks with all architectural conventions. 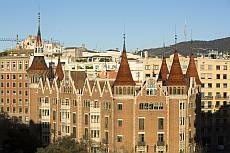 It was designed by Josep Puig i Cadafalch, built in 1905, and reminds of the towers of Neuschwanstein Castle. The Casa Amatller is a very nice building of the modernism. In this building you can particularly see the contrast of the architect Puig i Cadafalch to his competitors Gaudí and Domènech i Montaner. The CaixaForum is now home to a museum of contemporary art in a former textile factory designed by Puig i Cadafalch.